CRAVEN Cattle Marts (CCM), Skipton, has launched a new initiative in support of national farming charity, the Addington fund’s Tup 1 Ewe fund raising campaign. Launched last September, the Tup 1 Ewe fund was introduced to enable farmers to donate live sheep through participating auction markets around England and Wales, and nominate the sale proceeds to the charity. CCM has devised a new idea in a bid to give renewed impetus to the campaign. 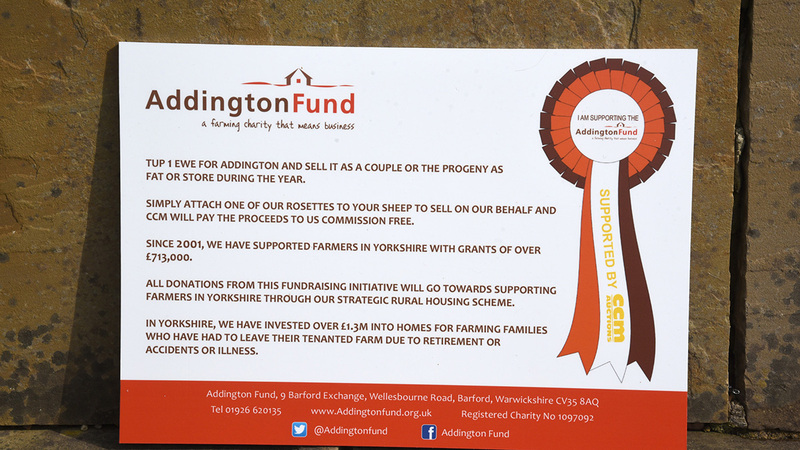 It involves purpose designed rosettes so potential buyers can clearly see which sheep are being sold in aid of the Addington fund. CCM general manager Jeremy Eaton said: “A farmer wishing to donate a lamb attaches a rosette to the sheep and we will do the rest commission free. Ian Bell, chief executive of the Addington fund said: “Livestock marts and farmers have always been incredibly supportive of our charity and one year down the line, this latest project should provide a timely boost to our fund raising.